An important consideration in all personal injury cases is what actually happened, perhaps more so in automobile accidents than in other incidents. As an automobile accident scene is “cleaned up” relatively quickly after the incident, your personal injury attorney can assist you in re-creating where each vehicle was using a map of the scene. A map for these purposes is a scale diagram of the streets and crossroads of the accident scene. This can be detailed enough to include cutout cars that can show where both the plaintiff’s vehicle and defendant’s vehicle were, as well as any other traffic in the vicinity. The scale diagram helps the jurors develop a visual image of the situation, and can turn most car accident cases into math problems that are objective and relatively easy to understand. Sometimes you, as the injured party, may be capable of creating such a map. Perhaps you did so immediately after the accident and the results are both accurate and objective. Far more often, however, that is not the case. It may be necessary for your personal injury attorney to retain a private accident investigator. The investigator will begin by going to the scene of the car accident, and preparing a scale diagram of the area. This will be a thorough assessment of the scene of the automobile accident, and will include such things as distances from landmarks like light poles or street signs. The diagram will also include crosswalks and the location of all traffic control devices. The investigator will also check city or county records to determine whether there have been any changes in the area from the date of the car accident to the time he measured. 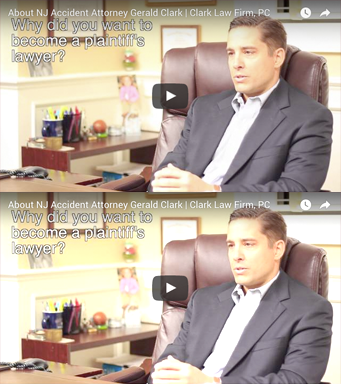 The Gerald Clark team, a group of personal injury attorneys in New Jersey, is well versed in all issues that may impact your case and ultimately your recovery. A consultation at no cost to you is available by calling (877) 841-8855. Call now.